Lord Narasimha was the fourth Avatar of Lord Mahavishnu, which was taken to kill the demon Hiranyakashipu. The story of Narasimha avatar is connected with the story of Hiranyakashipu and Prahlad. In Vishnu’s Varaha avatar the lord killed Hiranyakashipu’s brother Hiranyaksha. By this action Hiranyakashipu got angry towards Vishnu and decided to kill Mahavishnu. For this he took deep penance to appease Lord Brahma and attain magical powers to defeat Lord Vishnu. The Tapas continued for several years and Brahma Dev got satisfied with his great devotion and asked him what boon he need. Hiranyakashipu asked for eternity, but Brahmadev gave him the boon that he can choose his death according to his wish. Thus Hiranyakashipu wants his death to be in the following ways that, he will not be killed by any man or animal, not in air, water or sea, not in the home or outside, not at the day or at night, and not by any asthra or sasthra. By attaining the boon Hiranyakashipu considered himself as immortal. With his powers he began to ruin the life of people in three worlds. He asked all devotees of Vishnu to worship him instead of the Lord. Those who haven’t obeyed to worship Hiranyakashipu was killed without any mercy. He captured whole world and made every one under his control. He imprisoned Devans and Rishis. Everyone was terrified with his mystic powers and went to Lord Vishnu for help. Vishnu gave them the relief that Hiranyakashipu’s son Prahlad will become the cause of his death. So every Gods and Goddesses patiently waited to see how Prahlad will become the cause of the death of Hiranyakashipu. As years passed by Kayadhu, the wife of Hiranyakashipu, gave birth to Prahlad in the Ashrama of Narada Muni. Sage Narada used to tell stories of Lord Narayana to child Prahlada. Hearing the glorious tales he became the devotee of Lord Narayana. Hiranyakashipu who wanted everyone to worship him was greatly disappointed by hearing his own son chanting the names of Maha Vishnu. To change the mind of Prahlad the King sent his son to the Ashramam of Shukracharya’s sons Shaku and Amarka. However they were also unsuccessful in breaking the solid devotion of Prahlad. Picture of Prahlad and sage Narada All the efforts of Hiranyakashipu in changing the mind of Prahlad were in vain. At last he got angry with his son and decided to kill him. But each time Hiranyakashipu tries to kill Prahlad Lord Vishnu’s magical hands were there to protect him. The King’s soldiers tried to kill Prahlad by poisoning him, drowning him in water, and throwing him down from mountain. But Lord Vishnu saved him from all these attempts. The King then created a bonfire and asked his sister Holika to sit with Prahlad on her lap inside it. As Holika was immune to fire he thought that his son will be killed. But Prahlada escaped from fire without any harm. The angry Hiranyakashipu challenged Prahlad asked where his Narayana can be found. Prahlad replied “My Vishnu is omnipresent and there is not a single place Narayana is not found”. The King was furious and got up from his throne and asked Prahlad “Can you show me your Vishnu in this pillar as well?” Prahlad said “Yes, He is!” The King hit the pillar strongly with his mace. With a thundering sound the pillar cracked and Lord Vishnu appeared in the form of Lord Narasimha – the half man half lion form. 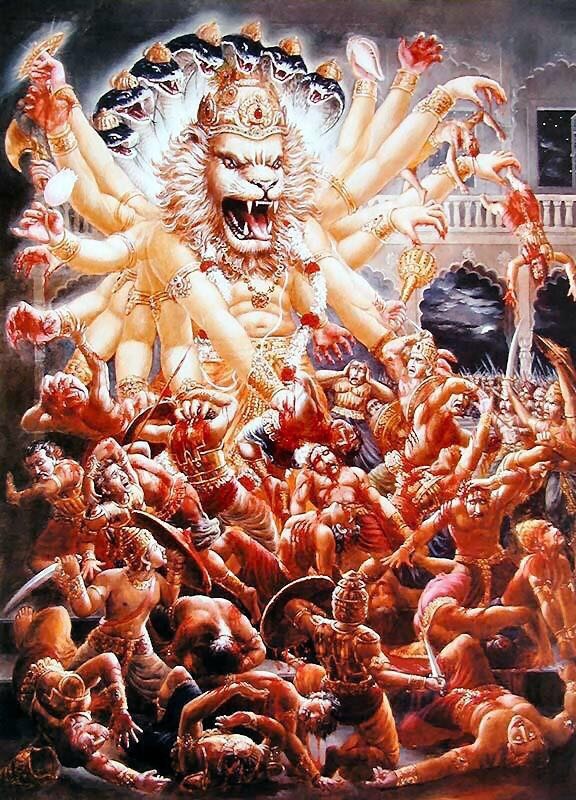 The furious Narasimha grabbed Hiranyakasipu, pulled him to his lap and tore open his body with his claws to kill the asura. 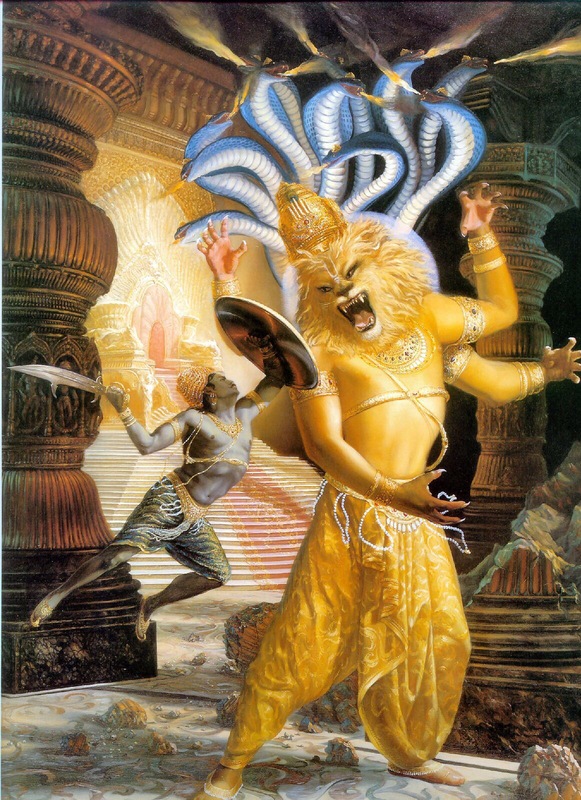 Lord Narasimha took this way to kill Hiranyakashipu so that Lord Brahma’s boon could not be offended. 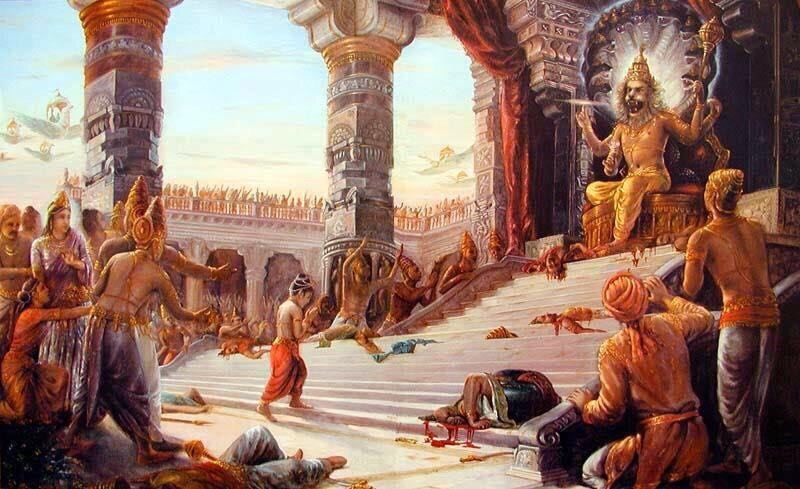 As Hiranyakashipu’s death wish and Brahma’s boon, Lord Narasimha was neither a man nor an animal, the time was twilight neither day nor night, he sat on the threshold of the room keeping the body of the Rakshas Hiranyakashipu on thighs, used his nails to kill the demon instead of astra or sasthra. 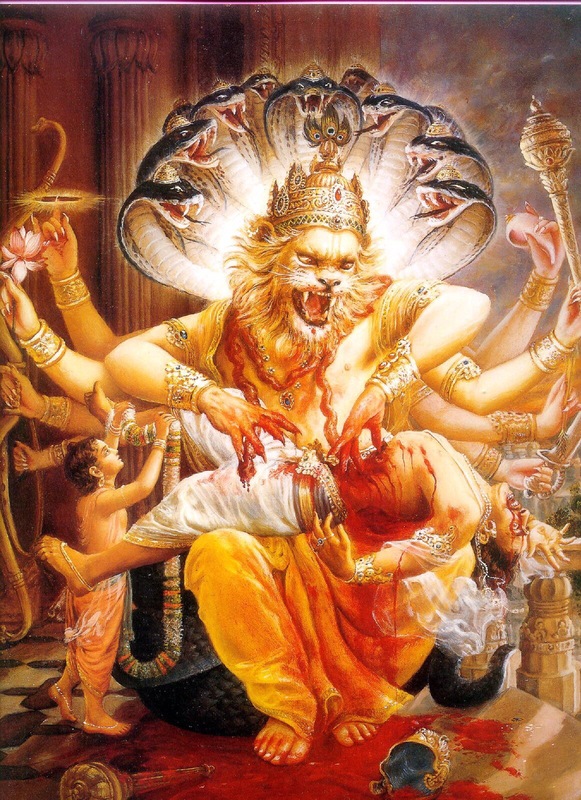 After killing the demon Hiranyakashipu Lord Narasimha was furious and was pacified when his devotee Prahlad touched his feet. 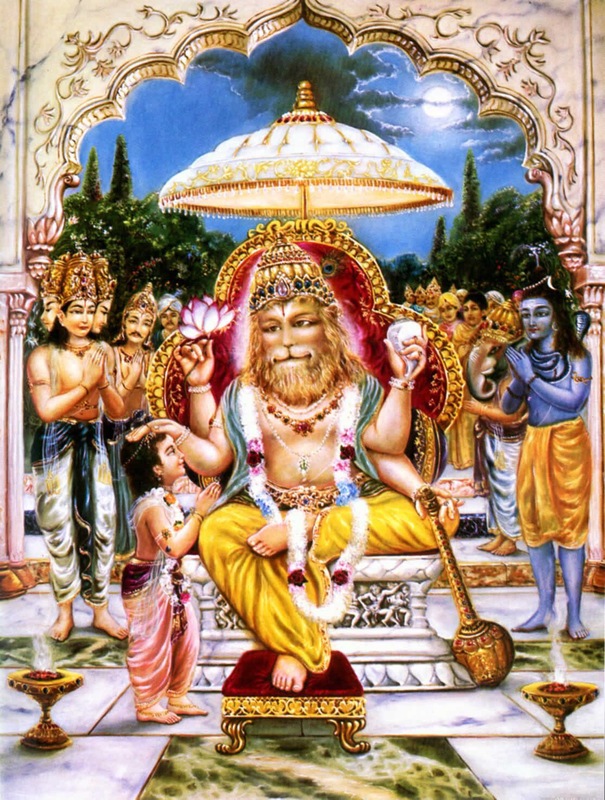 Prahlad was crowed as the next King by Lord Narasimha. 1. Sri Ugra Narasimha: – Also known as Prahalada Narasimha or Ahobila Narasimha. The lord self-manifested from a pillar to protect his devotee Prahalada from his arrogant father – the demon king Hiranyakasipu. Praying to Ugra Narasimha helps his devotees win over competitors in professional life, especially in business. He gives courage to overcome all kinds of fear. 2. Sri Yoga Narasimha –Yoga Narasimha is referred to the form of the lord who taught Yoga to Prahalada to attain eternal bliss. Worshipping Yoga Narasimha brings peace, mutual harmony and eternal bliss. He rescues his devotees from difficulties. 3. Sri Jwala Narasimha – When Narasimha’s anger reached its peak he became Jwala Narasimha and this is when he tore Hiranyakasipu. Praying to Jwala Narasihma brings good health and success in endeavors, hurdles in marriage disappear. 4. Sri Bhargava Narasimha –Bhargava Narasimha blesses you with leadership qualities, authoritative position in politics and administration. 5. Sri Krodha Narasimha -Also known as Varaha Narasimha as the lord has the face of a boar. His blessings remove obstacles and assure success, especially in real estate business. 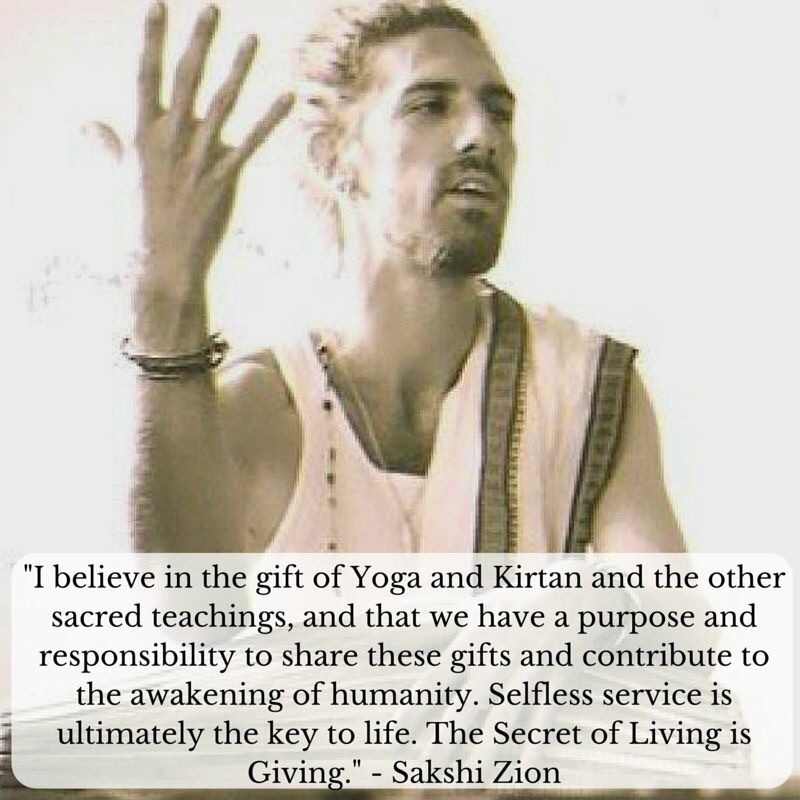 He help devotees win land disputes. 6. Sri Pavana Narasimha –Narasimha in this form is very peaceful. As per the Sages, Pavana Narasimha can liberate his devotees from sins committed in their present and past lives. He fills their lives with love and compassion. 7. Sri Malola Narasimha – Also known as Lakshmi Narasimha. The lord is full of mercy, love and compassion. Goddess Lakshmi, the consort of Narasimha is in a very happy and peaceful state with her beloved Lord. Worshipping Lakshmi Narasimha brings Brahmananda (unlimited joy) to this world and the higher world. Prayers are offered for peace and harmony and also for clearance of all kinds of debts. Goddess Lakshmi blesses you with Ashtaishwaryam (8 kinds of wealth). 8. Sri Chatravata Narasimha – It is believed that Ketu worshipped the Lord here and gained all comforts. 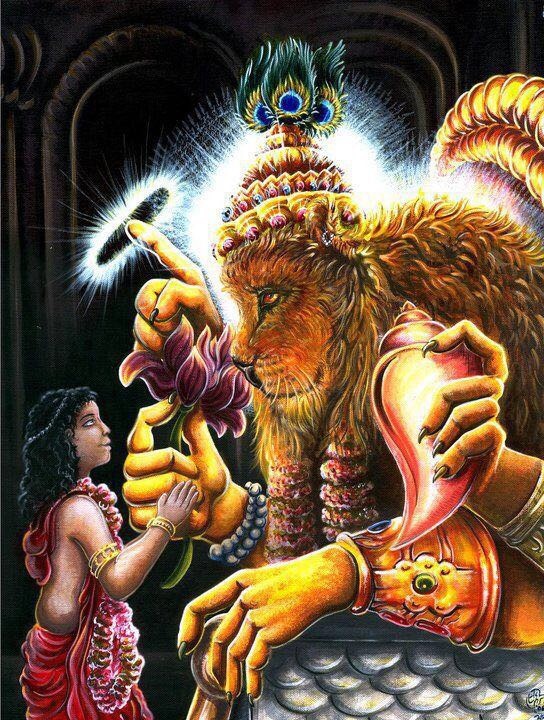 Blessings of Chatravata Narasimha help those in the profession of music and arts to gain proficiency and excellence. The lord also ensures good agricultural produce and stability of economy. 9. 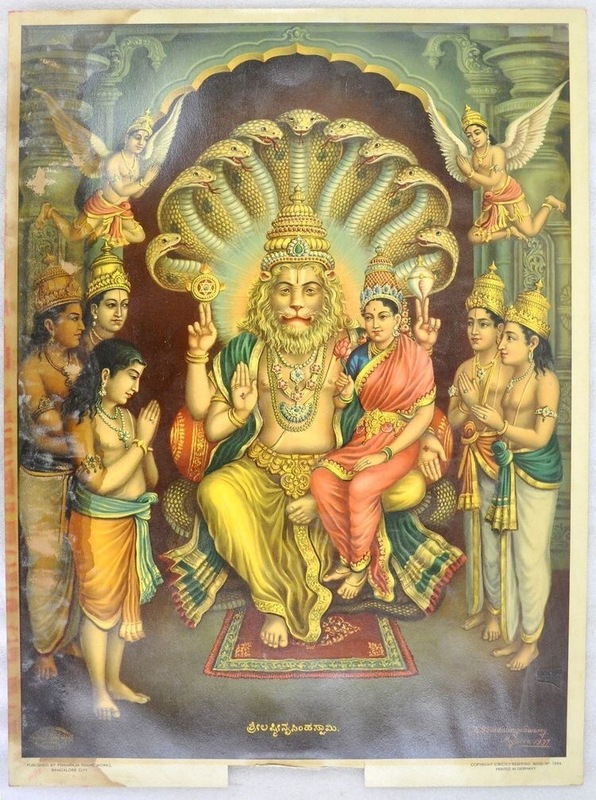 Sri Karanja Narasimha – When you worship Karanja Narasimha with three austerities (thought, word and action) you get enlightened and all your desires are fulfilled. The lord protects you from your enemies. According to Narasimha Purana, the 9 planets worshipped the 9 forms of Narasimha to liberate themselves from the curses of sages and attained their status and powers as planets. Therefore, worshipping Nava Narasimha mitigates malefic effect of the 9 planets. 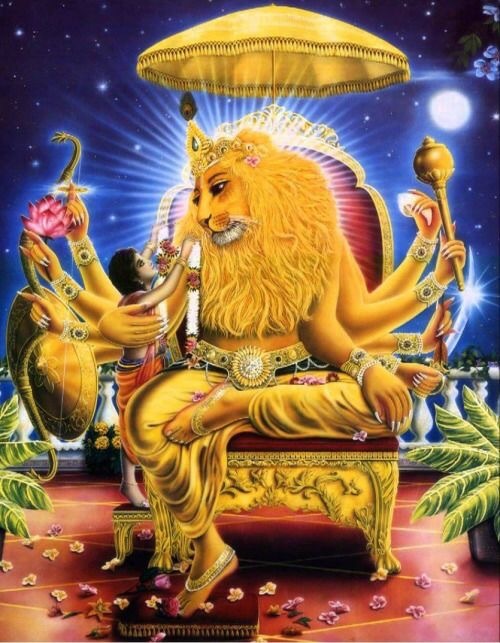 Here is one of my favorite documentaries about Lord Narasimha and His Holy Place Ahovalam Dham in India.